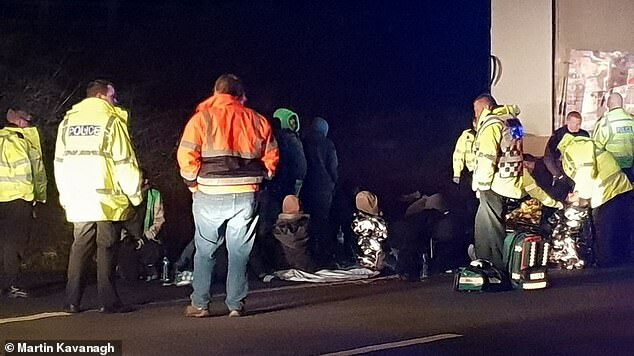 A lorry driver is being questioned by police after 27 suspected migrants were found in the back of his HGV on the M6. 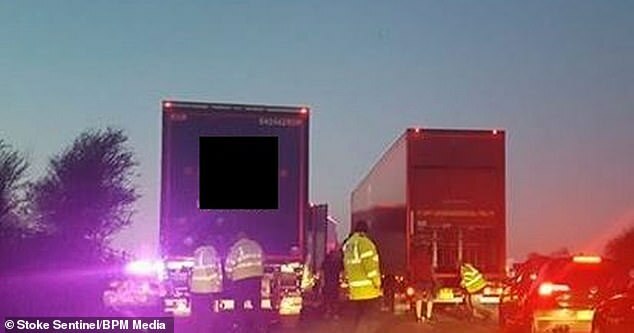 The motorway was closed in both directions after officers stopped and searched the lorry at around 5.15pm on Wednesday. 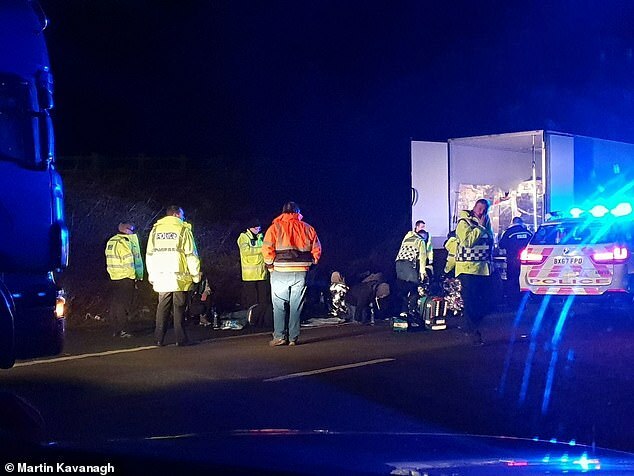 Drivers reported seeing people jumping from the back of the lorry before police rushed in near Stoke-on-Trent, while a helicopter was deployed to search the nearby area. All of those on board were medically assessed and transferred to immigration officials for interview, it is understood. The driver, who was arrested by Staffordshire Police, is being quizzed by immigration enforcement officers. More than a dozen police cars were spotted racing to the scene as hundreds of football fans trying to reach the Etihad Stadium for Manchester City’s Carabao Cup semi-final with Burton were stuck. Drivers reported seeing what they believed were migrants being lined up at the side of the road. ‘We could only see the lorries being chased down and stopped but we couldn’t see people running away,’ he said. The 30-year-old, who works in the telecoms industry, said he could see men being treated by ambulance medics on the floor. Martin Kavanagh was on his way home from Coventry when he got caught in the tailback. He told Sky News: ‘It looks to me like east African refugees, one lying on the hard shoulder, several have been taken into ambulances, there was one at large on the far side of the opposite southbound carriageway and police apprehended that individual and brought him back over. ‘There are multiple lorries involved. There are lots of police and paramedics here and they’ve done a super job, but we have not been given any communication from the police. ‘One or two people have gone up to the police, but they have kept them at a sensible distance and sent them back to their vehicles. 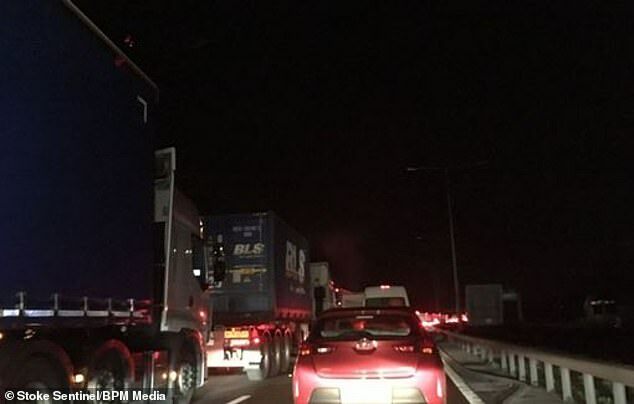 One motorist reports seeing 22 police vehicles making their way to the scene Highways England first reported the incident was affecting traffic on the Northbound carriageway between junction 15 and junction 16 at around 4pm – with 90 minute delays currently reported on the route. A police helicopter has been sighted in the area while local people said nearby woodland and grass areas were being searched in the dark. One motorist said he is in the queue but has not seen any other emergency services, except police. Hundreds of football fans are currently heading to the Carabao Cup tie between Burton Albion and Manchester City. Many have been stuck at Keele Service station for more than an hour. Many fans missed the game altogether. Gym manager Ray Burge, 57, spent four hours stranded on the M6 trying to get from work in Nottingham to the Etihad Stadium before turning back at 9pm. ‘It’s been absolutely pointless,’ the City fan said. Delays of more than two hours were being reported in the area. 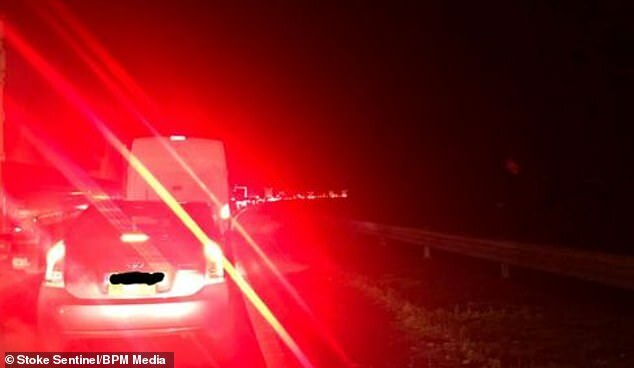 A Staffordshire Police spokesman said: ‘Officers from Staffordshire Police have stopped a vehicle on the M6 between Junctions 15 and 16 this evening (9 January) and a number of people have exited the back of the vehicle. ‘Police and partners are assessing the welfare of the people who exited the vehicle and we will be liaising with our colleagues in Immigration Enforcement.